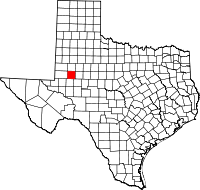 In Martin County, Texas County Clerk and District Clerk are a combined office, so vital records for birth, death, marriage, and divorce are all kept together. Records go back to the foundation of the county in 876 (from Bexar County) It was named for Wylie Martin, one of Stephen F. Austin's Old Three Hundred colonists. The original settlement now known as Stanton (the county seat) was first called Grelton and then Mariensfeld, which reflects the Roman Catholic and German character of early European settlers. The Texas State Historical Association is recommended for research.